DESCRIPTION: Each red capsule with pink band contains Isometheptene Mucate USP, 65 mg.; Dichioraiphenazone USP, 100 mg.; and Acetaminophen USP, 325 mg. Midrin capsules also contain FD&C Yellow No.6 as a color additive. Isometheptene Mucate is a white crystalline powder having a characteristic aromatic odor and bitter taste. It is an unsaturated aliphatic amine with sympathomimetic properties. Dichioraiphenazone is a white, microcrystalline powder, with slight odor and tastes saline at first, becoming acrid. It is a mild sedative. 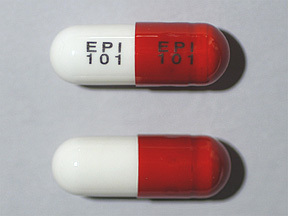 Acetaminophen, a non-salicylate, occurs as a white, odorless, crystalline powder, possessing a slightly bitter taste. ACTIONS: Isometheptene Mucate, a sympathomimetic amine, acts by constricting dilated cranial and cerebral arterioles, thus reducing the stimuli that lead to vascular headaches. Dichloraiphenazone, a mild sedative, reduces the patient's emotional reaction to the pain of both vascular and tension headaches. Acetaminophen raises the threshold to painful stimuli, thus exerting an analgesic effect against all types of headaches. * Based on a review of this drug by the National Academy of Sciences - National Research Council and/or other information, FDA has classified Midrin with a less-than-effective indication, aka "possibly" effective in the treatment of migraine headache. Final classification of a migraine "effective" indication requires further investigation. However many migraine sufferers report that Midrin is a better choice when compared to the side effects and cost of therapy with triptans like Imitrex, Treximet, Maxalt, Relpax, Zomig, Axert, Frova, and Amerge. A majority even indicate Midrin a more useful abortive than Ultram (Tramadol) and opiods like Vicodin and Oxycodone which are sometimes prescribed. CONTRAINDICATIONS: Midrin is contraindicated in patients with glaucoma and/or severe cases of renal disease, hypertension, organic heart disease, hepatic disease and in those who are presently on monoamine-oxidase (MAO) inhibitor therapy. PRECAUTIONS: Caution should be observed in patients with hypertension, peripheral vascular disease and after recent cardiovascular attacks. ADVERSE REACTIONS: Transient dizziness and skin rash may appear in hypersensitive patients. This can usually be eliminated by reducing the dose. - FOR RELIEF OF MIGRAINE HEADACHE: The usual adult dosage is two capsules at once, followed by one capsule every hour until relieved (up to 5 capsules within a twelve hour period). - FOR RELIEF OF TENSION HEADACHE: The usual adult dosage is one or two capsules every four hours, up to 8 total capsules per day. HOW SUPPLIED: Red capsules imprinted with pink band, the letter "C" and 86120. Bottles of 50 capsules, NDC 0086-0120-05. Bottles of 100 capsules, NOC 0086-0120-10, Store at controlled room temperature 15-3OC 59-86F in a dry place. Are you having trouble getting your current Midrin prescription (Rx) filled at the local pharmacy? 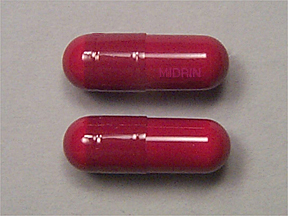 Midrin's manufacturing pharmaceutical company says it is now producing new shipments of Midrin. We will soon have a listing of pharmacies (by zip code) that guarantee carrying Midrin or a generic version of this combination drug with the same ingredients (such as Epidrin). Another option (to save cost and time) is to buy it online. This site is not maintained or approved by the actual makers of Midrin. And it is a work in progress. We just put this site up because as Midrin takers ourselves, we were frustrated with the lack of information out there about Midrin and how hard it can be to obtain these days.